Finally, the government of the Philippines officially apologised for what happened on 23 August 2010, when its Filipino SWAT team botched their storming of a hostage bus filled with Hong Kong tourists. Naturally, there are mixed responses to the apology depending on one's standpoint. Survivors and the families of the victims are obviously not satisfied, whereas politicians and government officials say they are pleased that there is a late apology, and others who push for more concessions. It is impossible to please everyone, no matter what. This is the nature of being human. Philippine President Rodrigo Duterte took Hong Kong by complete surprise on Thursday, making a full public apology for the Manila bus hostage crisis that left nine people dead nearly eight years ago. On his second visit to the city in 10 months, the outspoken leader upended his predecessor’s steadfast refusal to accept the blame for the botched rescue attempt that resulted in the deaths of eight Hongkongers and the rogue policeman who hijacked their tour bus. “For the first time – the Chinese government and the people of China have already been waiting for this – there has been no official apology coming from the Filipinos regarding what happened in August 2010,” Duterte told a gathering of the city’s Filipino residents. The apology drew wild applause from the 2,500-strong crowd at the Kai Tak Cruise Terminal. Former president Benigno Aquino had frequently refused to apologise for the handling of the crisis. An official statement of “most sorrowful regret and profound sympathy” was the best the victims’ families could get during his presidency. The disastrous rescue attempt also left 13 Hong Kong tourists injured in Manila’s Rizal Park, and the subsequent fallout prompted the city to issue a black travel alert against the Philippines. However, the two governments and victims’ families reached an agreement in 2014 under which an undisclosed amount of compensation was paid by Manila. Duterte’s apology was met with mixed feelings by family members of the victims and survivors on Thursday. “The Philippine government has been evading its responsibility over the tragedy for the past eight years until now, when eventually a representative from the government has offered an apology. It is a form of respect to the victims’ families,” said Tse Chi-kin, elder brother of tour guide Masa Tse Ting-chunn, who was killed in the incident. He hoped the government would seriously review the incident to avoid future tragedies. Yik, whose lower jaw was shattered by a bullet, had to undergo reconstruction surgery 50 times and is still receiving treatment. She added that the apology would not mean much to the victims’ families after so many years. Democratic Party lawmaker James To Kun-sun, who helped the affected families, said the apology, although late, was a positive sign. But To said the president should also examine the case of four Hong Kong fishermen who were being “unreasonably prosecuted” in the Philippines. The jailed men, aged 30 to 51, were arrested in Subic Bay in July 2016 after a raid on a “floating crystal meth laboratory”. They have denied all charges and are being held in a prison in Olongapo for drug possession and manufacturing. Earlier on Thursday, dozens of migrant activists took to the streets near the hotel where the president was staying in Tsim Sha Tsui. Protesters criticised the fact that they were restricted to a small area far from Duterte’s sight. They also noted the disproportionate number of police officers. The president was due to leave Hong Kong on Thursday night. Probably most of the HK people have already forgotten about the tragedy! Well done Duterte. This is how things should be done - for those thick-skulled unrepentant politicians and government officials. Apologiesmarathon? you apologized for the previous president so the next president will apologize for you? Showing the Japanese how its properly done. Thank You Mr. President. This comment was unpublished due as a result of contravening Terms & Conditions. It is only the government who kept on going back on apologies. Accept the apology - it is the civilised thing to do and there is no point crying over spilled milk. The “guarantee” - take it with a huge pinch of salt. How is that “guarantee” going to be implemented? Their police is so corrupted that they even tried to collect ransom from the family of a Korean businessman whom they had “accidentally” killed in one of their so-called drug “raids”. Empty promises are worthless! Okay, apology should be well received by those who were killed and relatives and friends of the victims, I think. What’s next? Perhaps, president Duterte might need to consider ordering investigation task force into how the ex mayor, Alfredo Siojo Lim handled the case in 2010. Apology means acknowledging wrongdoing and its logical to ask how wrong Alfredo Siojo Lim did at that time. China could learn from Duterte's example by apologizing to the victims of the Tiananmen massacre, apologizing to the 10-20 million children who were victims of the one-child policy and weren't recognized as citizens being born as second/third children, and apologizing to Chinese citizens that were victims of Mao's policies. Duterte has done a great job in improving ties with China. A token of peace is always a right step forward. You would know the meaning of an apology if you see the battle led by the surviving victims of Nazi occupation, Japanese occupation, Tiananmen sq etc..., just to have their plight formerly recognized. My respect to President Duterte. Much respect for him for doing this. What a great change it has been since Acquino. Aquino vs Duterte, very big contrast. One crawled out from beneath the skirt of his mother to won presidency vs one fought crimes heavily in his town and then won presidency. One said HK's CEO was not in the same level to talk to him during the tragedy vs one comes to HK to deliver apology. Philippines voted Duterte for a very noble reason. He works hard for the good of his country and our entire region. You gotta give him this he has a backbone maybee our appointed leaders ( loosers?) can learn here something ? finally, somebody, has a big enough shadow, to say what's needed to be said years ago. thank you. Whatever his detractors say about him being evil and heartless, it takes a lot of guts, humanity and humility for him to make that public apology. That makes him much more of a man and president than his predecessor Aquino could ever be. This is a big step towards putting the matter to rest between Hong Kong and Philippine. Hope the families of those HK victims find it in their hearts to forgive and look forward. The sad incidence happened during Aquino's term. Aquino bears the full responsibility for it. But Duterte is big enough to bring a resolution by apologizing to HK. HK should return the grace, instead of sending SAFE to confront Duterte. The HK students are out of control. They must be told to behave! I'm sorry, you seem very mis-informed. The SAFE students wanted to respectfully hand over a petition with over 1,000 signatures, collected primarily from the pinay community. This was not a "confrontation". If standing up against unethical fees and black market employment agencies is "out of control" I am afraid you do not understand what actually occurred and you should do your research before spreading false information. Although many people poke fun at Asians making crass English mistakes (see Engrish.com which has many errors sourced from China and Japan), much hilarity can also be found in Americans who are incorrectly assumed to be naturally good at English. It perhaps reveals Americans in general are ignorant of other cultures and countries, and the fact that many many Americans need to travel and experience living overseas. In this episode of Shark Tank (S9E14), the sharks mauled a party wear sticker company named EVREWARES. Eventually, Mark Cuban put the owners out of their misery and bought the whole company for USD200,000. The idea being to use the products in the sports industry for game-day party wear. 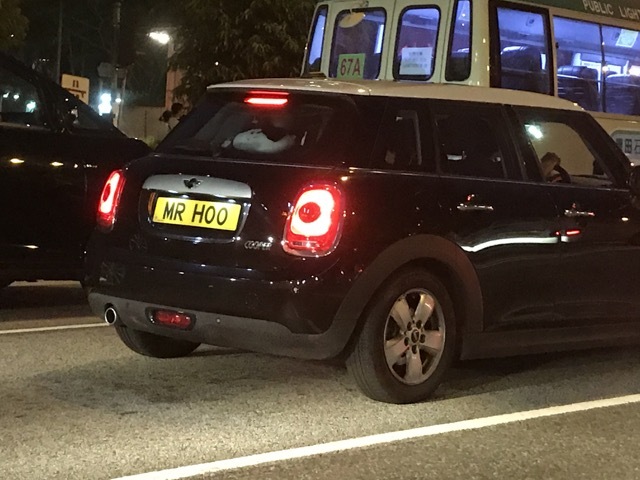 Sorry, it's Mr Hoo to you !